Citizen CL-S6621 - Thermal transfer printing, 203 dpi, 6.6" print width, USB, Ethernet, and Serial Interfaces, and US Power cord. Cables sold separately. The unique 6-inch CL-S6621 label printer sets a new standard for desktop machines. Smaller and more efficient than any other comparable printer, the CL-S6621 offers automatic Cross-Emulation, for easy integration and compatibility, and features our advanced Hi"'Lift Mechanism. 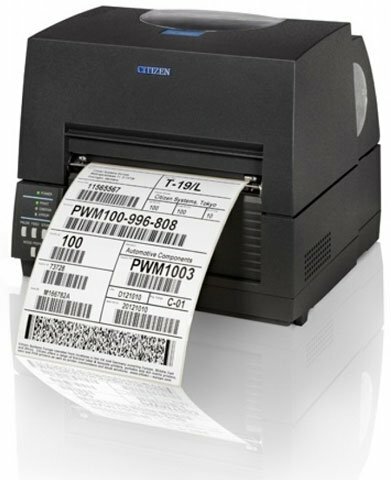 The CL-S6621 delivers precision printing with fast media loading and ease of use, making it the perfect solution for tough, reliable and high volume label printing. The Citizen CL-S6621UGEN is also known as Citizen America	CIT-CLS6621UGEN	or CLS6621UGEN	.